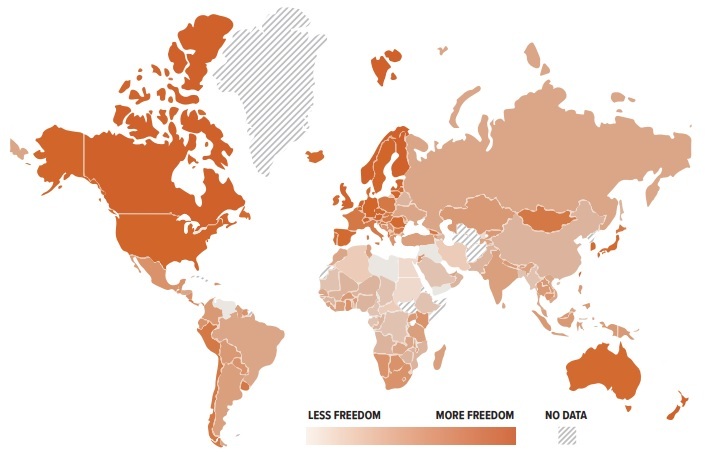 What’s the world’s freest nation? I’ve suggested that Australia as an option if the United States ever suffers a Greek-style collapse, but my answer wasn’t based solely on that country’s level of freedom. Another option is to look at Economic Freedom of the World, which is an excellent resource, but it only measures the degree to which a nation allows free markets. 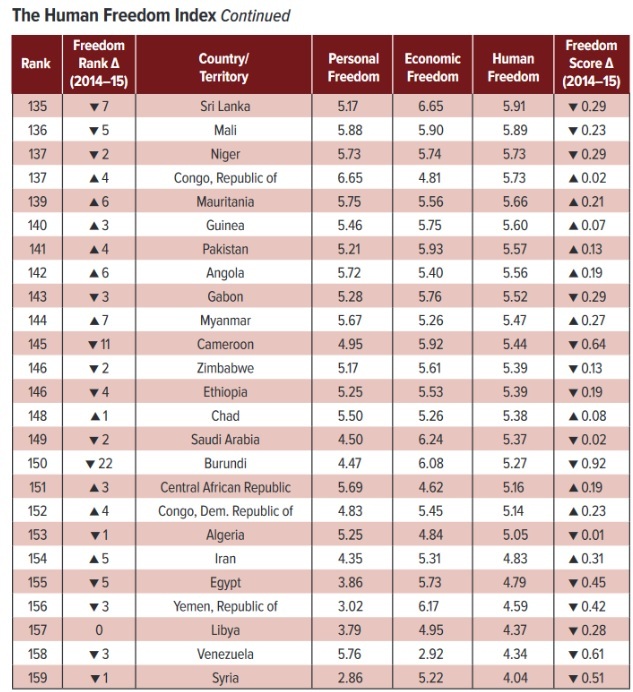 If you want to know the world’s freest nation, the best option is to peruse the Human Freedom Index. First released in 2013, it combines economic freedom and personal freedom. The 2018 version has just been published, and, as you can see, New Zealand is the world’s most-libertarian nation, followed by Switzerland and Hong Kong. The United States is tied with Sweden for #17. If you scan the top-20 list, you’ll notice that North America, Western Europe, and the Antipodes (Australia and New Zealand) dominate. And that also is apparent on this map (darker is better). So maybe “western civilization” isn’t so bad after all. Here is an explanation of the report’s guiding methodology. Simply stated, it’s a ranking of “negative liberty,” which is basically freedom from government coercion. The Human Freedom Index casts a wide net in an attempt to capture as broad a set of freedoms as could be clearly identified and measured. …Freedom in our usage is a social concept that recognizes the dignity of individuals and is defined by the absence of coercive constraint. …Freedom thus implies that individuals have the right to lead their lives as they wish as long as they respect the equal rights of others. Isaiah Berlin best elucidated this notion of freedom, commonly known as negative liberty. In the simplest terms, negative liberty means noninterference by others. …This index is thus an attempt to measure the extent to which the negative rights of individuals are respected in the countries observed. By negative rights, we mean freedom from interference—predominantly by government—in people’s right to choose to do, say, or think anything they want, provided that it does not infringe on the rights of others to do likewise. 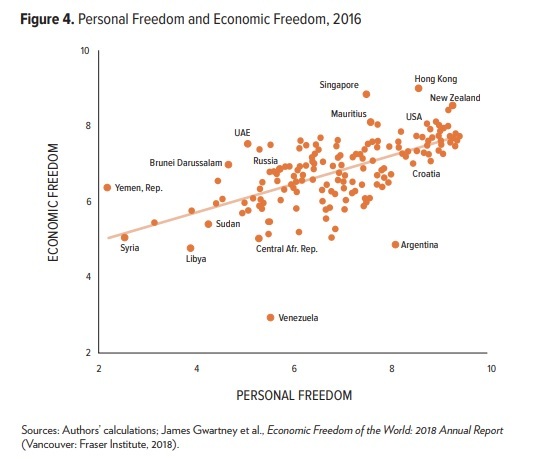 Unsurprisingly, there is a correlation between personal freedom and economic freedom. Though it’s not a perfect correlation. The Index highlights some of the exceptions. 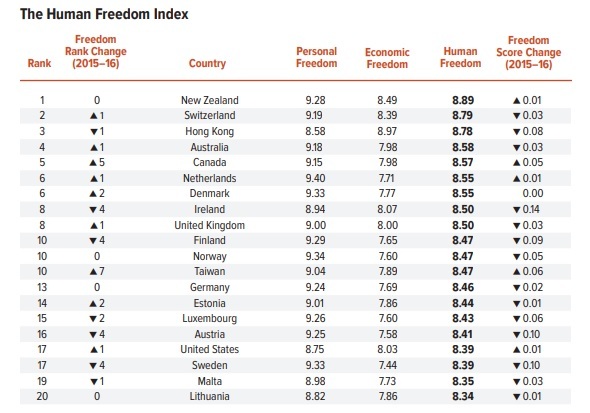 Some countries ranked consistently high in the human freedom subindexes, including Switzerland and New Zealand, which ranked in the top 10 in both personal and economic freedom. 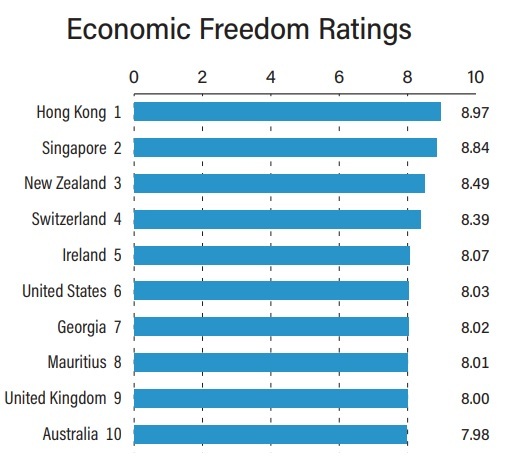 By contrast, some countries that ranked high on personal freedom rank significantly lower in economic freedom. For example, Sweden ranked 3rd in personal freedom but 43rd in economic freedom; Slovenia ranked 23rd in personal freedom but 71st in economic freedom; and Argentina ranked in 42nd place in personal freedom but 160th in economic freedom. Similarly, some countries that ranked high on economic freedom found themselves significantly lower in personal freedom. For example, Singapore ranked in 2nd place in economic freedom while ranking 62nd in personal freedom; the United Arab Emirates ranked 37th in economic freedom but 149th in personal freedom; and Qatar ranked 38th in economic freedom but 134th in personal freedom. This raises an interesting question. If you had to move, and assuming you couldn’t move to a nation that offered both types of freedom, would you prefer a place like Sweden or a place like Singapore? As an economist, my bias would be to choose Singapore. 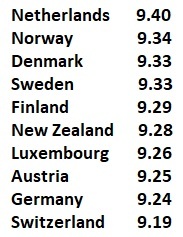 But if you look at the nations in the top-10 for personal freedom, they’re all great place to live (and they tend to be very market-oriented other than their big welfare states). So I certainly wouldn’t blame anyone for instead choosing Sweden. P.S. There are some very attractive micro-states that were not including in the Human Freedom Index, presumably because of inadequate data. I suspect places such as Bermuda, Liechtenstein, Monaco, and the Cayman Islands would all get very high scores if they were included. The Swiss people are normally very sensible when asked to vote in national referendums. Here are some recent results. In 2010, nearly 60 percent of the electorate rejected a class-warfare income tax proposal. In 2014, Swiss voters overwhelmingly killed a minimum-wage mandate. Also in 2014, the voters of Switzerland rejected single-payer healthcare by a landslide margin. And in 2015, more than 70 percent of voters rejected a federal death tax. In 2016, there was a landslide vote against a scheme to provide universal basic income. Though my favorite referendum result occurred several years before I started writing on this site. In 2001, the people of Switzerland voted by a 5-1 margin in favor of a spending cap. Given all these results, you won’t be surprised to learn that Switzerland is near the top in rankings of economic freedom, trailing only Hong Kong, Singapore, and New Zealand. But this does not mean that Switzerland is a libertarian nation. At least not in an ideological sense. And we have two new referendum results that underscore this point. 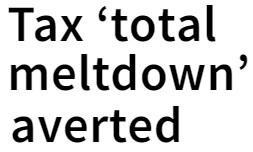 This past weekend, Swiss voters had an opportunity to get rid of the central government’s value-added tax, personal income tax, and corporate income tax. Ending those taxes would be a libertarian fantasy, but the initiative to extend the levies was easily approved. Voters were swayed by arguments that a no vote would cause too much fiscal disruption. Slashing the central government’s budget by 60 percent might appeal to ideological libertarians, but it didn’t fly with don’t-rock-the-boat Swiss voters. 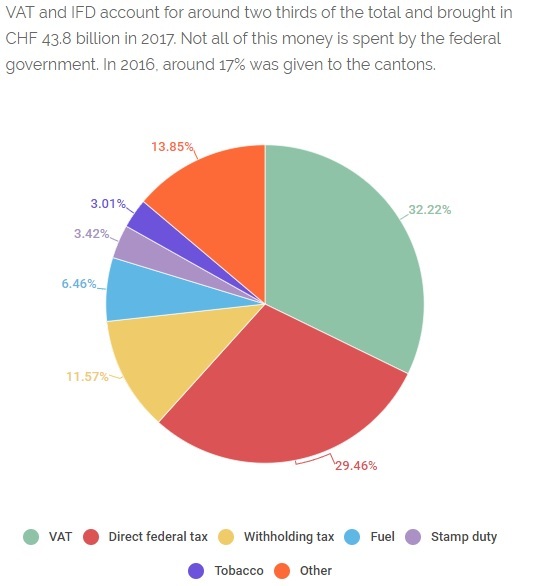 The direct federal tax and the sales tax together contributed about two-thirds of the Swiss central government’s budget, bringing in around 43.5 billion Swiss francs ($44.25 billion) in 2016. …Should voters reject the measure, the government would have to slash spending by more than 60 percent practically overnight or find new sources of revenue, Maurer told reporters. Here’s a pie chart showing the revenue sources for the central government. I would have voted no, of course, and I wish more Swiss voters had lined up against the initiative. Not because I would have thought that an immediate 60-percent reduction in the size of the central government was feasible. But a larger share of no votes at least would have sent a signal to politicians in Bern that frugality is a good idea. There was another referendum over the weekend that also produced an unfortunate result. Swiss voters approved continuing subsidies for state-run media. The Swiss Broadcasting Corporation, Switzerland’s public broadcaster is largely funded by a broadcasting fee. This fee, known colloquially as Billag, the name of the agency that collects it, is paid by most companies and essentially every household. The No Billag initiative, is a bid to do away with fee. …the No Billag vote was rejected by 71.6% of voters. The margin of defeat is especially disappointing since libertarians actively campaigned for this initiative. Switzerland, like many European nations, has certain television and radio channels that are run by the government. …Together with other classical liberals in Switzerland, Frédéric Jollien is fighting against the royalties imposed by the government for media consumption. 450 Swiss Francs, the equivalent of €382 or $456, is the annual fee that consumers are required to pay, regardless if they want state-run TV and radio channels or not. …Journalists (who, by the way, are exempt from paying this fee) are releasing heavy verbal fire on the campaigners. They claim it would cause massive unemployment in the media sector, that it is anti-democratic, and that it would enable big foreign companies to take over the Swiss market. Alas, the fear campaign succeeded. 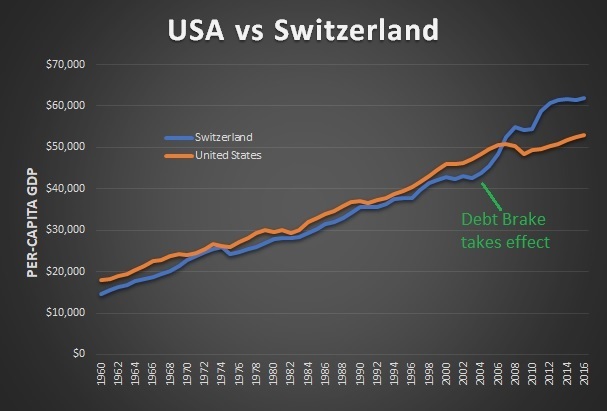 But I hasten to add that this doesn’t mean Switzerland is turning towards statism. I suspect the real story is that the Swiss are content with the status quo. And the status quo (especially by European standards) is a practical form of libertarianism. Here’s some of what Dan Hannan wrote last year. I have always loved Switzerland…its devolved decision-making, its entrenched Euroskepticism. …I am a Helvetophile for many of the same reasons as America’s Founders. James Madison was fascinated by the way Switzerland had “no concentered authority, the Diets being only a Congress of Delegates from some or all of the Cantons.” …George Mason was entranced by the militia system: “Every Husbandman will be quickly converted into a Soldier, when he knows & feels that he is to fight for his own. It is this which preserves the Freedom and Independence of the Swiss Cantons, in the midst of the most powerful Nations.” …Switzerland has stubbornly retained its sovereignty, despite being surrounded by the EU. …Swiss democracy is direct, decentralized and devolved. Most fiscal decisions are taken locally. Result? Swiss voters are the happiest in Europe, their economy is the freest, and their state budget the smallest. And let’s not forget that Switzerland is still a bright spot on gun rights. In February 2011, Swiss citizens voted in a referendum that called for a national gun registry and for firearms owned by members of the military to be stored in public arsenals. …Hermann Suter, who at the time was vice president of the Swiss gun-rights group Pro Tell, told the BBC then. “The gun at home is the best way to avoid dictatorships—only dictators take arms away from the citizens.” Apparently many of his fellow Swiss agreed. The referendum was easily defeated. Gun ownership in the country has deep historic roots… guns are popular… Children as young as 12 are taught how to shoot…and are encouraged to participate in highly popular target-shooting competitions. The country’s cultural attachment to firearms resembles America’s in some ways…it has the third-highest rate of private gun ownership in the world… The Swiss Defense Ministry estimates that there are 2 million privately owned weapons in the country of 8.3 million people. Yet there’s almost no gun-related crime. Switzerland has a low rate of gun crime, and hasn’t seen a mass shooting since 2001. And let’s not forget that the fiscal burden of government in Switzerland is comparatively modest. Not by libertarian standards. Not by historical standards. But compared to other European nations, Switzerland is a fiscal Shangi-La. The tax burden is lower, and spending consumes a smaller share of economic output. And this translates into lower levels of red ink. P.S. I find Switzerland to be a very interesting case study, for reasons noted above and also on issues such as decentralization, privacy rights, gun rights, and private retirement savings. But I’m a policy wonk, so I’m drawn to unusual examples. What does surprise me is that other people must be interested in the country as well. My 2011 column comparing Switzerland and the United States is the 7th-most-viewed piece in the history of this site. 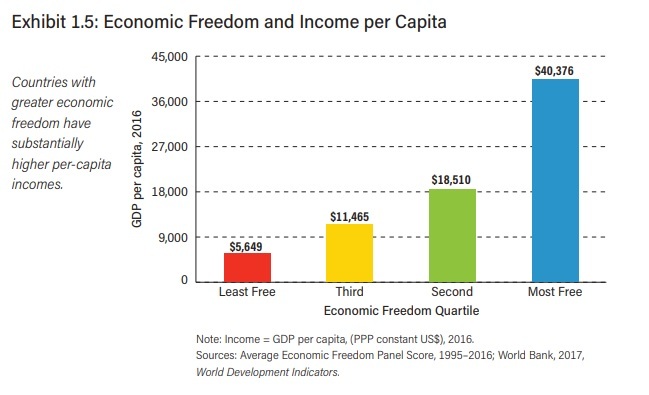 Last September, Economic Freedom of the World was released, which was sort of like Christmas for wonks who follow international economic policy. I eagerly combed through that report, which (predictably) had Hong Kong and Singapore as the top two jurisdictions. I was glad to see that the United States climbed to #11. The good news is that America had dropped as low as #18, so we’ve been improving the past few years. The bad news is that the U.S. used to be a top-5 country in the 1980s and 1990s. But let’s set aside America’s economic ranking and deal with a different question. I’m frequently asked why European nations with big welfare states still seem like nice places. My answer is that they are nice places. Yes, they get terrible scores on fiscal policy, but they tend to be very pro-market in areas like trade, monetary policy, regulation, and rule of law. So they almost always rank in the top-third for economic freedom. To be sure, many European nations face demographic challenges and that may mean Greek-style crisis at some point. But that’s true of many developing nations as well. Moreover, there’s more to life than economics. Most European nations also are nice places because they are civilized and tolerant. For instance, check out the newly released Human Freedom Index, which measures both economic liberty and personal liberty. As you can see, Switzerland is ranked #1 and Europe is home to 12 of the top 16 nations. And when you check out nations at the bottom, you won’t find a single European country. Instead, you find nations like Venezuela and Zimbabwe. Indeed, the lowest-ranked Western European country is Greece, which is ranked #60 and just missed being in the top-third of countries. Having now engaged in the unusual experience of defending Europe, let’s take a quick look at the score for the United States. 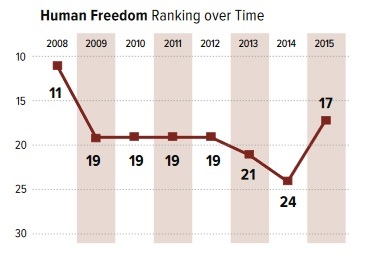 As you can see, America’s #17 ranking is a function of our position for economic freedom (#11) and our position for personal freedom (#24). For what it’s worth, America’s worst score is for “civil justice,” which basically measures rule of law. It’s embarrassing that we’re weak in that category, but not overly surprising. Anyhow, here’s how the U.S. score has changed over time. Let’s close with a few random observations. Other nations also improved, not just the United States. Among advanced nations, Singapore jumped 16 spots and is now tied for #18. There were also double-digit increases for Suriname (up 14 spots, to #56), Cambodia (up 16 spots, to #58), and Botswana (up 22 spots, to #63). The biggest increase was Swaziland, which jumped 25 spots to #91, though it’s worth pointing out that it’s easier to make big jumps for nations with lower initial rankings. Now let’s look at nations moving in the wrong direction. Among developed nations, Canada dropped 7 spots to #11. Still a very good score, but a very bad trend. It’s also unfortunate to see Poland drop 10 spots, to #32. Looking at developing nations, Brunei Darussalam plummeted an astounding 52 spots, down to #115, followed by Tajikistan, which fell 46 spots to #118. Brazil is also worth highlighting, since it plunged 23 spots to #120. P.S. I don’t know if Moldova, Ukraine, and Russia count as European countries or Asian nations, but they all rank in the bottom half. In any event, they’re not Western European nations. P.P.S. 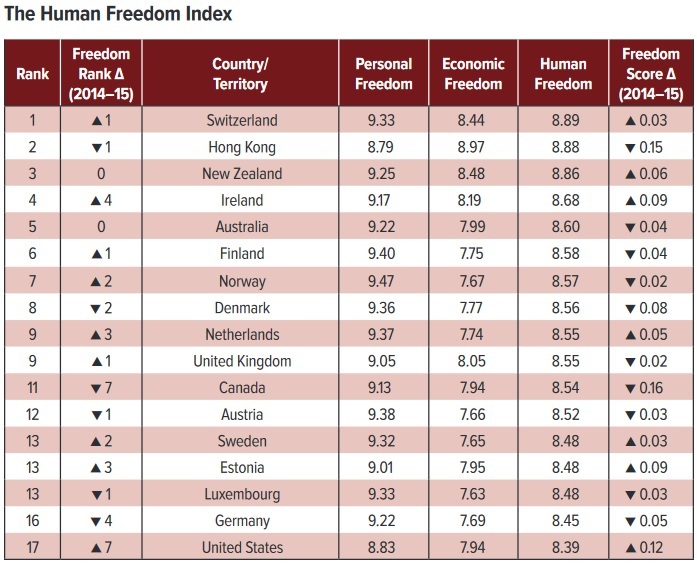 I mentioned last year that Switzerland was the only nation to be in the top 10 for both economic freedom and personal freedom. In the latest rankings, New Zealand also achieves that high honor.